If you’re having trouble finding the perfect Christmas present for the foodie in your life, then look no further. With Pomora, you can adopt an olive tree in Italy (either Sicily or Campania) on their behalf, and every quarter they’ll receive three cans of delicious olive oil direct from their grower. The lanes near our house have been heavy with the heady scent of wild garlic flowers in the last few days, the warmth of the late spring sunshine increasing their intensity. We’re nearing the end of the wild garlic season, so I’ll be picking one last harvest to make up a big batch of wild garlic pesto. It freezes beautifully and will provide us with a taste of English spring for many months to come. The pesto is delicious simply stirred through a bowlful of pasta or spread on toasted bread to create bruschetta. It’s also wonderful in this easy tear-and-share bread, a perfect accompaniment to cold meats and cheeses as part of a buffet lunch or a springtime picnic. Put the flour, salt and dried yeast into a large mixing bowl and combine. Make a well in the middle and pour in the water and oil. Gradually work the flour into the liquid to form a soft dough. If it’s too dry, add a drop more water. If it’s too sticky, add some more flour. Flour the work surface before tipping the dough onto it. Knead the dough for five to ten minutes, until the dough is smooth and elastic. Grease and flour a 20cm round cake tin. Uncover the risen dough and punch it back down. Flour the surface again and divide the dough into eight equal portions. Roll each portion of dough into a rough rectangle, approximately 20cm by 10cm. 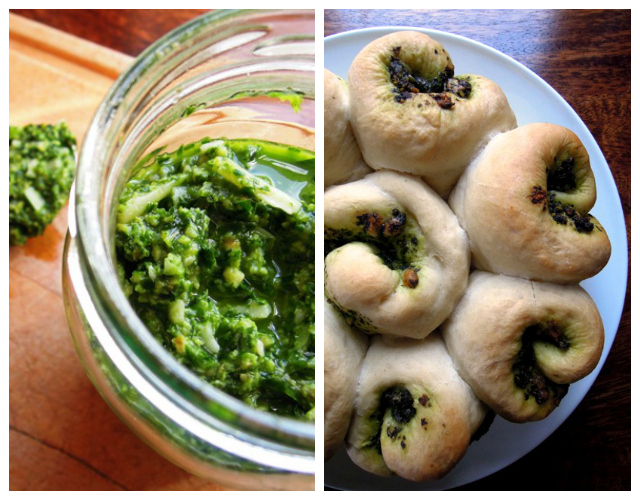 Spread each rectangle generously with wild garlic pesto and roll up carefully into a tidy spiral. Stand each spiral into the prepared cake tin, spacing them out to allow them room to spread. Cover loosely with cling film or a clean tea towel and leave to rise again for another 45 minutes to an hour. When the bread has risen again, place in the oven and bake for 15 to 20 minutes. Place the tin on a wire rack and leave to cool for 10 minutes before turning out. Lovely eaten while still warm, drizzled with a little olive oil. As this bread makes use of a sensational spring ingredient, I’m entering it into this month’s Four Season’s Food challenge hosted by Eat Your Veg and Delicieux where the theme is Celebrating Spring. And as it’s a very seasonal recipe, I’m also entering it into Simple and in Season hosted by Ren Behan. Finally as it features wild herbs, I’m sharing it with Karen at Lavender & Lovage in this month’s Cooking with Herbs challenge. While I adore caraway in slow-cooked meaty dishes (such as my braised pig cheeks in red wine or my family favourite Bolognese), when I think of caraway I do tend to think of bread. As I said before, one of my earliest memories of caraway is smelling it in a little Jewish bakery in Stamford Hill in North London as a child. But until this week, I’ve never actually baked my own bread with caraway. To be honest, we’re quite boring with our bread, most of which is made in the breadmaker, carefully timed so that we have a freshly baked loaf awaiting us in the morning. That’s probably the only thing I have in common with David Cameron. Thank goodness. I am married to a man who loves his gadgets and so it is no surprise we own a breadmaker. It is also no surprise, therefore,that it is my husband who makes most of our bread in said breadmaker. But on those occasions when I decide I want to make bread, I usually do it the old fashioned way, by hand, in an oven. If I didn’t work almost full-time, I’d probably bake more bread this way. But I do, so I don’t. My husband prefers his loaves fluffy and white. I like mine brown, seedy and substantial. The children eat whatever’s going, thankfully. I guess I really should have tried a rye bread for my first experimentation with caraway in breadmaking. But that might have been a step too far for my other half. I’ll work up to that. 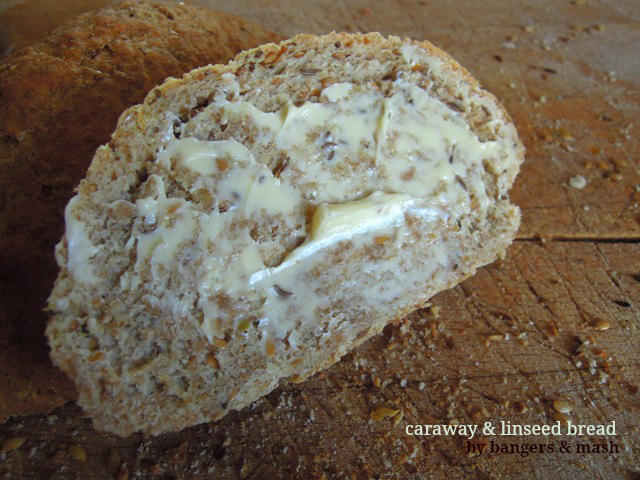 For my first caraway bread, I decided on a simple wholemeal loaf with a spattering of caraway and linseed. I’m not completely sure why I ended up with this particular combination, but it’s probably got something to do with picking up a big bag of linseed in Holland and Barrett when I actually went in to purchase something entirely different, and needed to use it up somehow. Apparently it is one of the most potent sources of omega 3 fatty acids found in nature and offers a whole host of health benefits besides. I just thought they tasted rather nice. Put the flour, yeast and salt into a large bowl and mix together. 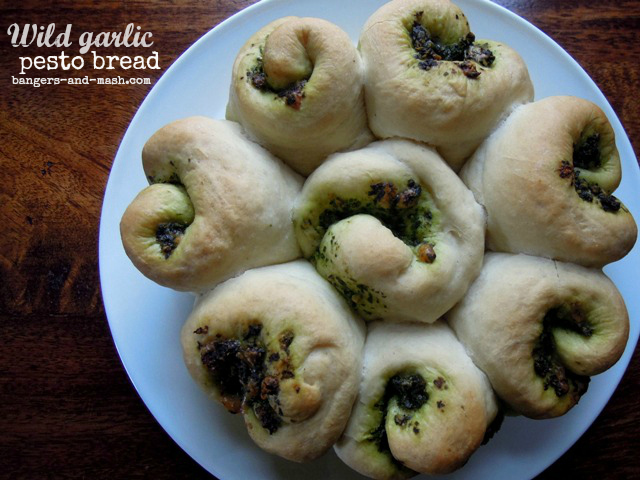 Pour in the sunflower oil and water and combine with your hands to form a dough. If it’s too dry, add a drop more water. If it’s too sticky, add a little more flour. Lightly flour your work surface and knead the dough for around 10 minutes, until the dough is smooth and elastic. Return the dough to the mixing bowl, cover loosely with cling film or a clean tea towel and leave in a warm place for about an hour, until the dough has doubled in size. Uncover the risen dough and punch it back down. Flour the surface again and knead the dough for a couple of minutes. Gradually knead in the caraway and linseed until evenly dispersed through the dough. Shape the dough into a round and place on a well-floured baking tray. Cover the dough again with cling film or a tea towel and leave again until it has doubled in size. Bake the bread for 10 minutes, then reduce the heat to 190°C/gas mark 5 and bake for 20 to 30 minutes until the loaf is browned and sounds hollow when tapped on the base. When I do it in the Aga, I bake the bread near the top of the top oven for 10 minutes and then move to the bottom of the oven for the remainder of the time. 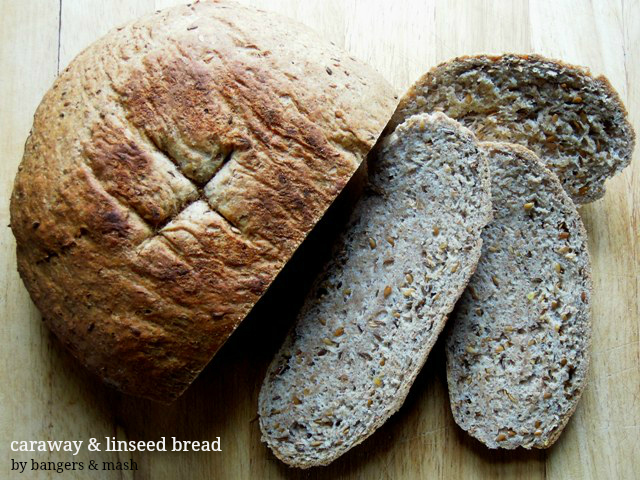 This caraway and linseed bread is another of my entries for this month’s Spice Trail challenge. Why is it that as soon as the school holidays start, the rain comes? Hopefully today’s downpour was just a temporary blimp but it’s always good to have some rainy day activities up your sleeve, just in case. My children always love a bit of baking. I usually love it too, although I do have to be in just the right mood to cope with the mess that generally ensues. 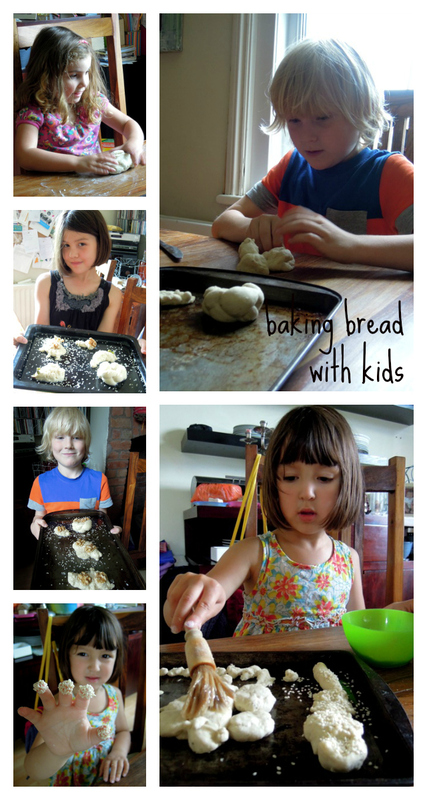 We try not to stick to ‘kiddy’ things like fairy cakes and smiley faced pizzas and I find bread making is a perfect activity for children. 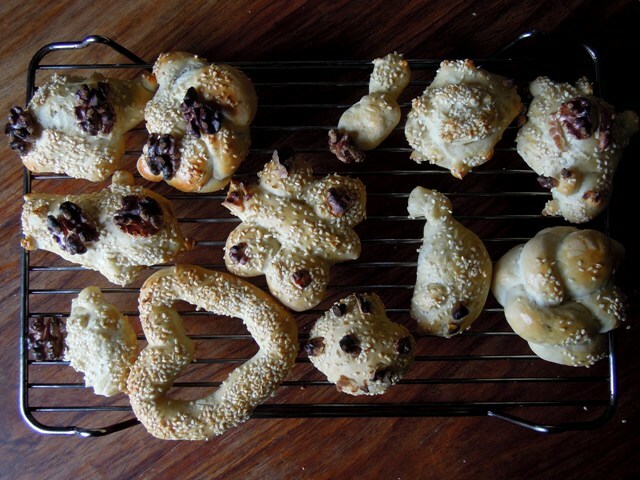 There’s the magic in waiting for the dough to rise and the fun of fashioning the bread rolls into just about any shape imaginable from plaits and hearts to hedgehogs, butterflies and caterpillars. This is what we ended up doing when my friend Sarah came over for the day with her children Jack and Molly. 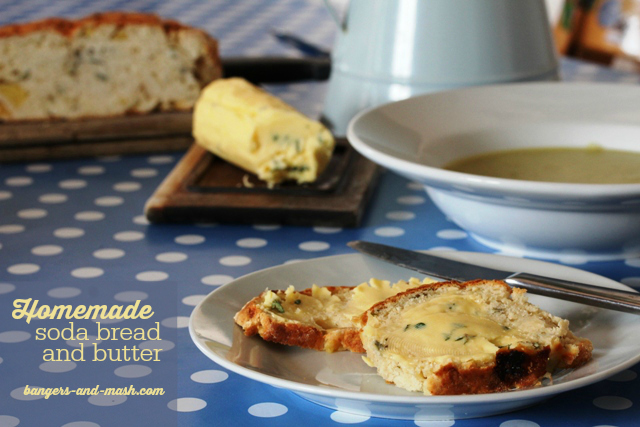 Not only is it such good fun to make, you then get to tuck into the wonderfully warm bread for your tea, spread thickly with lots of butter and jam. 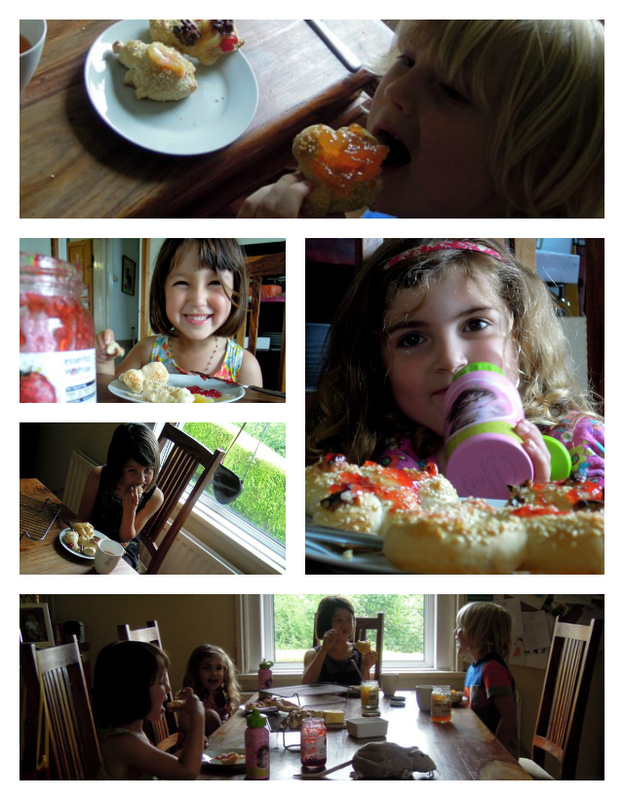 Children always really enjoy eating food they have made themselves, don’t they? Put the flour, salt and dried yeast in a mixing bowl and combine well. Make a well in the mixture and pour in the water and olive oil. 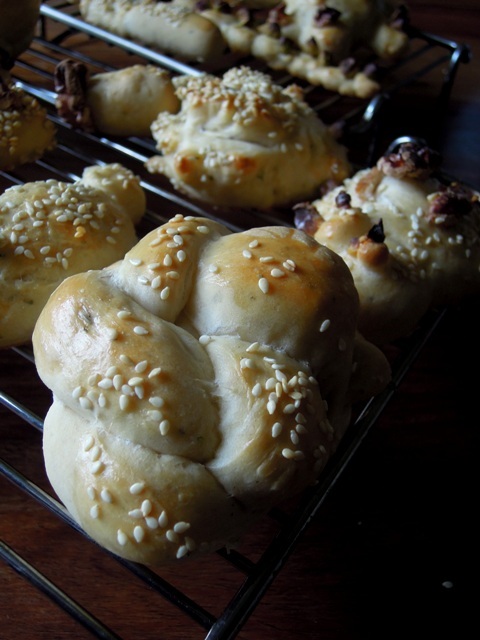 Gradually work the flour into the oil and water to make a soft dough. If the mixture is dry, add a little more water. If it is sticky, add a little more flour. Sprinkle a little flour onto your work surface. Knead the dough for five to ten minutes by stretching it away from you and then pulling it back into a ball. Keep going until the dough feels elastic and smooth. Return the dough to the mixing bowl and cover with cling film or a clean tea towel. Leave in a warm place for around an hour until the dough has roughly doubled in size. Punch the dough to release the air and divide the dough between your children, and let the creativity begin. My daughter Jessie likes to make little hedgehogs using scissors to clip the spikes and pistachio nuts for eyes. Mia has a thing for caterpillars, placing lots of little balls of dough in a line. It helps to brush the bread with a little oil to keep seeds and nuts in place. Put their creations on a baking tray greased with a little oil. Bake in the oven for 10 to 15 minutes, depending on size, until they are golden brown. Allow to cool a little on a wire rack before devouring with butter and jam. Delicious! 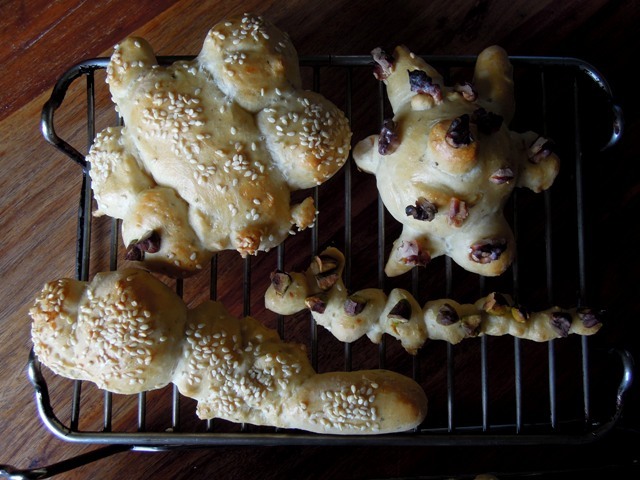 What do you like to bake with your children? Now that I’m working full-time again, the only chance I really have to play around in the kitchen is at the weekends. But then if I spend too much time in the kitchen, I feel bad that I’m not spending enough time with the kids. So wherever possible I try to involve Jessie and Mia in the cooking too. On Saturday, after spending the afternoon in Bath shopping for new clothes (my girls are growing so blinking fast at the moment! 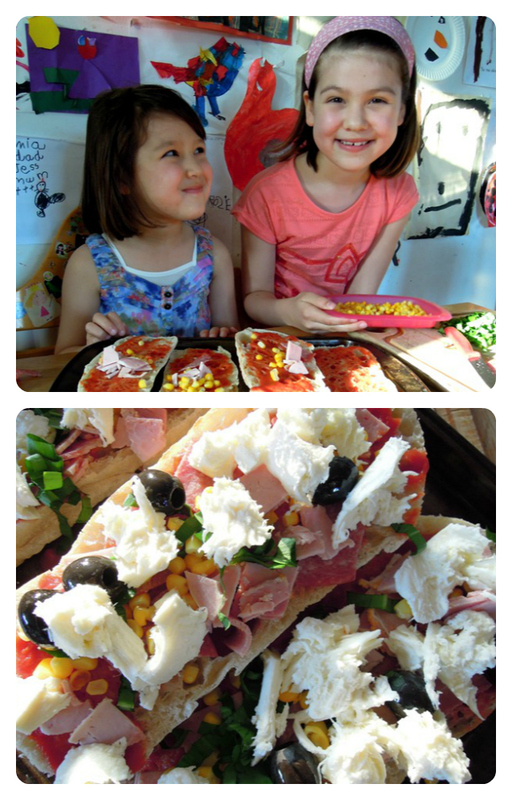 ), we rustled up some quick ciabatta bread pizzas for an easy tea. And the girls enjoyed deciding on their own toppings. I’m not really sure whether to call these posh open grilled sandwiches or ciabatta pizzas – I guess they’re somewhere in between. And they don’t really warrant a recipe. I simply spread some passata on sliced ciabatta (you may prefer French bread or even a slice of cottage loaf) before the girls got going with their own special creations. 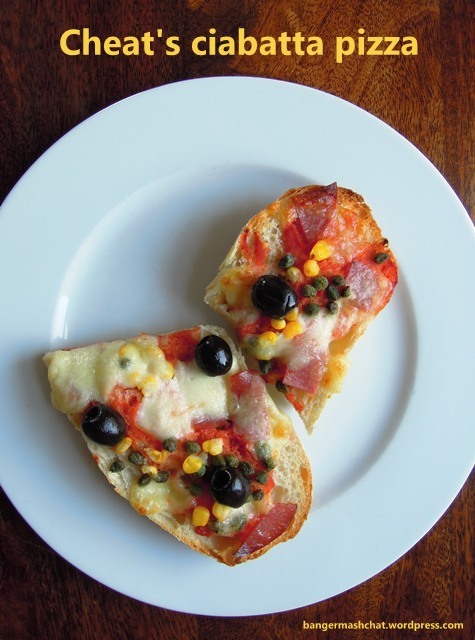 Up for grabs was whatever we found in the fridge; leftover tinned sweetcorn, ham and salami, some chopped wild garlic leaves we’d picked from the hedgerows, black olives, capers and of course lots of mozzarella cheese. Mia likes to play safe when it comes to food and kept her pizza topping simple. She isn’t a big fan of strong flavours like olive and capers. Despite that, she did go crazy with the wild garlic, and ate it all quite happily. 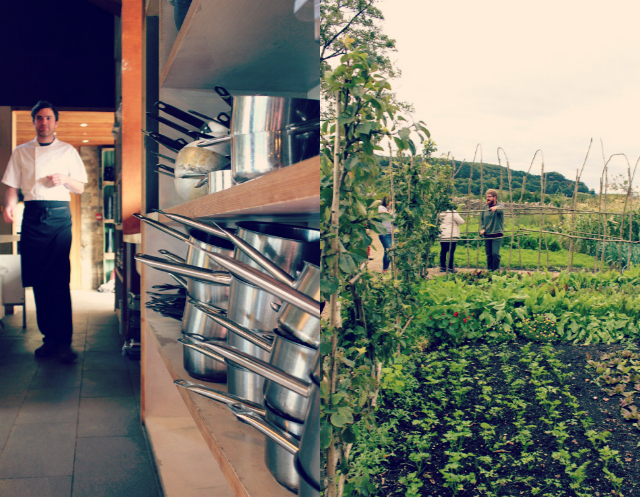 Jessie, on the other hand, has always been much more adventurous with food, and went for everything on offer. If there had been raw chillies, she’d probably have thrown some of those on there too. 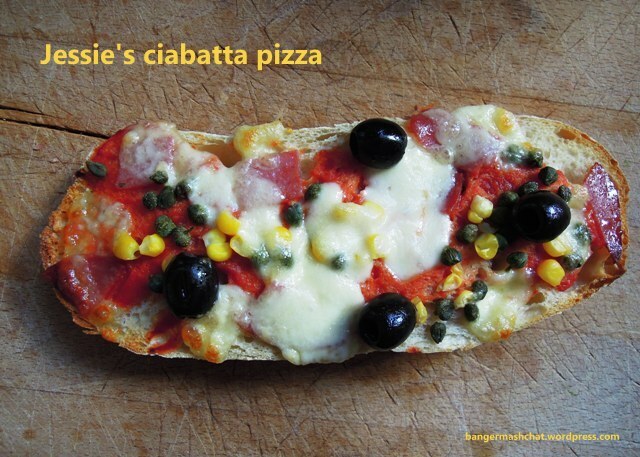 Smother the ciabatta with passata and decorate with your chosen toppings. Tear the mozzarella and place on top. 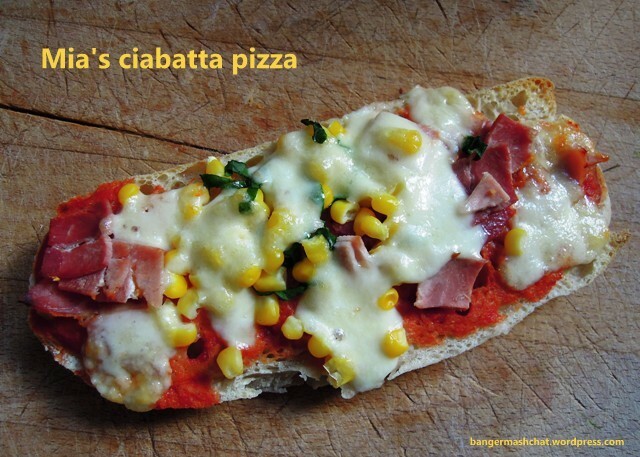 Place your ciabatta pizzas on a lightly greased baking tray and pop in the oven (or alternatively under a medium grill) for 10 to 12 minutes, until the bread is lightly toasted and the cheese has melted. Easy as.